I’m eating something yummy right now. Right as I type this, I’m eating dinner. Yes, it’s late — 10 p.m. But that’s how I roll some days. So, I’m so excited about it I had to blog right away. And all the credit goes to Rebekah at PDX Food Love. Kudos to her for this yummy yummy recipe. So, I saw her recipe that involved cranberries, and I knew I had to try it … because we have a bag of fresh cranberries. Cranberries are great, but I can only eat so many of them plain. Like probably about five. I knew I had most of the ingredients in Rebekah’s recipe. But I didn’t have parsley. She called it Couscous with Cranberries, Apples and Parsley. So I’d have to figure something else out. Oh, and another important note, I didn’t have couscous either. But I DID have quinoa. So, I decided to go for it. Oh, and here’s where Rebekah got her inspiration. The outcome was glorious (see below). And now there are leftovers. Oh, and I think this was the perfect way to bring in December … with a dish that LOOKS like Christmas. 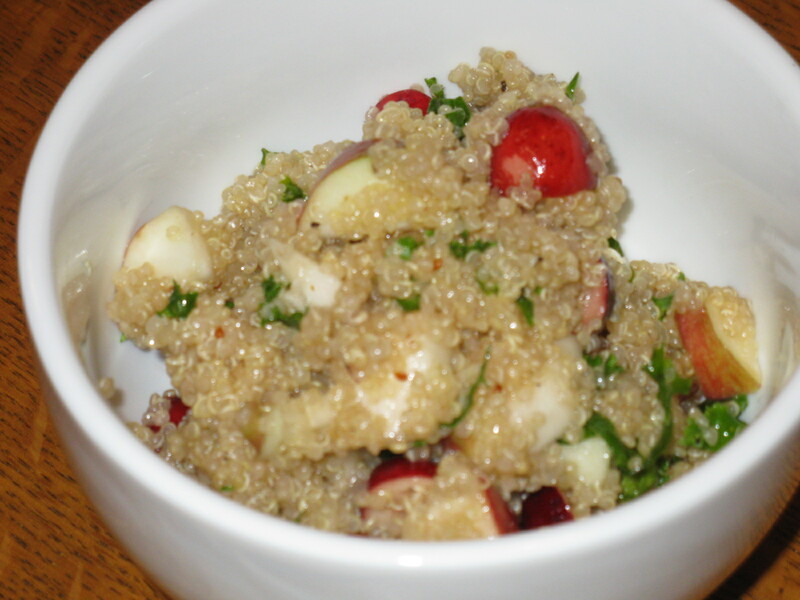 I call my version Quinoa with Cranberries, Apples and Kale. Rebekah’s photos are much nicer … but this is what I just gobbled up. Disclaimer: I don’t usually use all caps. That’s how excited I am about this. So yummy and easy and healthy … and wonderful at 10 p.m. when you haven’t had dinner yet. My mom and I recently spent an evening together making chili. It was really just an excuse to see each other and catch up. It’s such a blessing to have your mom just 20 minutes away … especially when fall weather comes and you start to crave hearty soups and lots of healthy leftovers. One of my favorite meals today — because it was a staple around the house growing up —is my mom’s chili. She puts in tons of veggies, which, to me, is what truly makes chili. All those recipes with meat, chili sauce and beans just don’t cut it. My mom adds rice, also. So, with the risk of revealing some long-kept family secret … here’s her chili recipe. By the way, she wasn’t opposed to me blogging about chili, so I don’t think there’s any issue with me sharing this. This one can be made on the stove or in a crock pot. 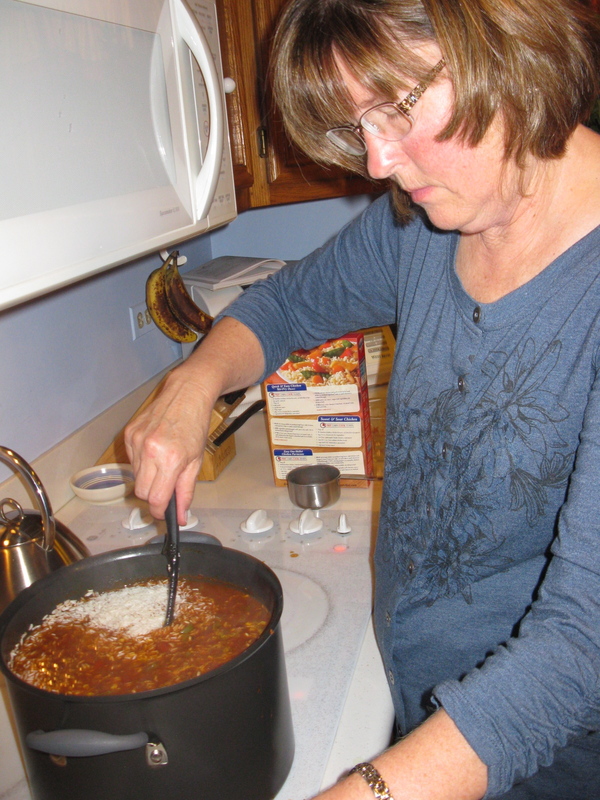 My mom makes an appearance on the blog ... while mixing her stove top chili. Cook and stir meat in large skillet on medium-high heat until meat is browned. Drain off excess fat. In large stock pot combine remaining ingredients, including beef; bring to a boil, reduce heat to low; cover and simmer 20-30 minutes, stirring occasionally. Add more water if chili is too thick. Serve with shredded cheese and sour cream. We also made this amazing white chicken chili, which is so yummy. I forgot to take pictures of this one, and I thought I had taken one of a single serving, but I can’t find it. I’ll add one when I get around to taking that. Oh, and the recipe came from a slow-cooker recipe book that my mom pulls out frequently. Combine all ingredients in crock pot. Cover and cook on low 8 – 10 hours, or high 4 – 5 hours. Serve with warmed tortilla chips topped with melted cheddar cheese. And, what would chili be without cornbread? I morphed this recipe from one I found here from The Vegan Chikpea, who also modified it from a recipe she found. I have several suggestions, and the two times I made it, it turned out yummy. Of course, it was smothered in chili, so how could it not be good? 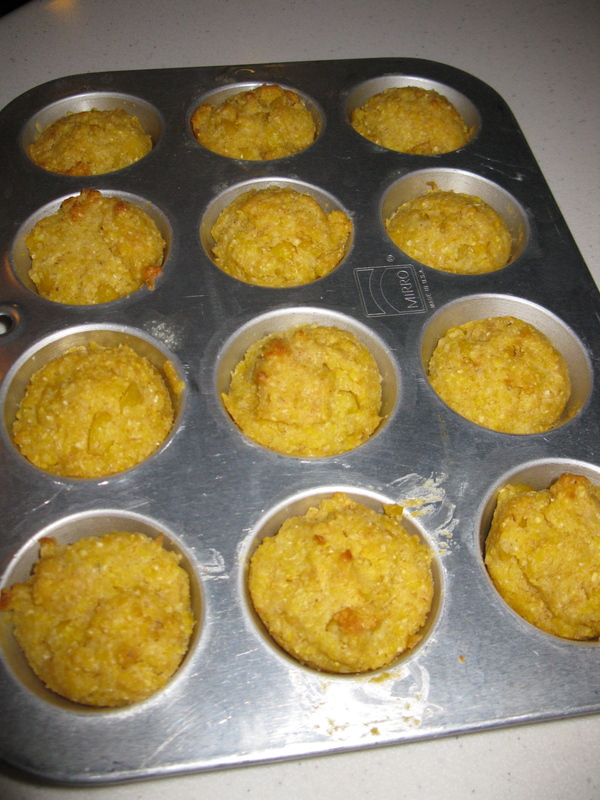 These are actually mini corn muffins ... should have been more careful about making sure their size was evident. Set oven to 350 degrees. In a saucepan, melt butter. Add applesauce and stir until well combined. Remove from heat. Put 1 cup of corn in food processor and chop until it is course. Add applesauce and butter mixture, salt and sugar. Process until well combined. Mix should be fairly chunky. Dump mixture into a mixing bowl. Add the cornmeal and flour. Mix well. Bake for 10 minutes. Flip and cook for 3 more minutes. Lots of wonderful chili has been consumed at my house recently. The husband’s favorite is the white chicken … it has such a good chili flavor. I can’t wait for more stews and cold-weather food.